If you want to get valuable traffic to your website by winning a featured snippet on Google, the Featured Snippet report in Position Tracking will guide your efforts. You can get quick insights from this report, such as how many of the target keywords you’ve added to your campaign have featured snippets, how many featured snippets your website already has (if you have any) and how many opportunities there are for your website to go after. The data will be based on the domain entered in the target domain field at the top. To see how many featured snippets a competitor has, just enter their domain in the target domain field. Above the table, you’ll see how many total keywords from your campaign have featured snippets (27 in the example above), and a trend of their overall appearance and the target domain’s presence in them. This will show keywords that have a featured snippet on their SERP where the target domain is NOT featured in the snippet. By default the tab is sorted by the difference in organic positions between the target domain and the URL that currently resides in the featured snippet. This way, the featured snippets that you are closest to and have a good chance of targeting will be listed at the top of the table. Notice that the target domain’s rank will be listed under the “You” column, and the URL that’s in the featured snippet is listed under the “Who is in Featured snippet” column. Take note of their position as well, because oftentimes the URL that occupies the featured snippet is not always in the first or second organic position. If you outrank any of these URLs, then you’ll see that keyword at the top of the report. In these cases, it could be easy for you to make a change to your content in order to overtake the current page in the featured snippet. To learn why this page has the featured snippet, click on the link to the page and take note of how their content is presented. Do they provide a list? Is it written in short sentences, or longer paragraphs? You can also take a look at SERP source to see how the snippet appears within the results page by clicking on the blue number in the row and choosing the “View SERP” button. These observations will give you insight into what could potentially help you acquire the featured snippet. For suggested ideas, be sure to add your landing page and target keyword into the On Page SEO Checker. The “Est. Traffic potential” estimates how much daily traffic you can expect to gain if your site acquires the featured snippet position. 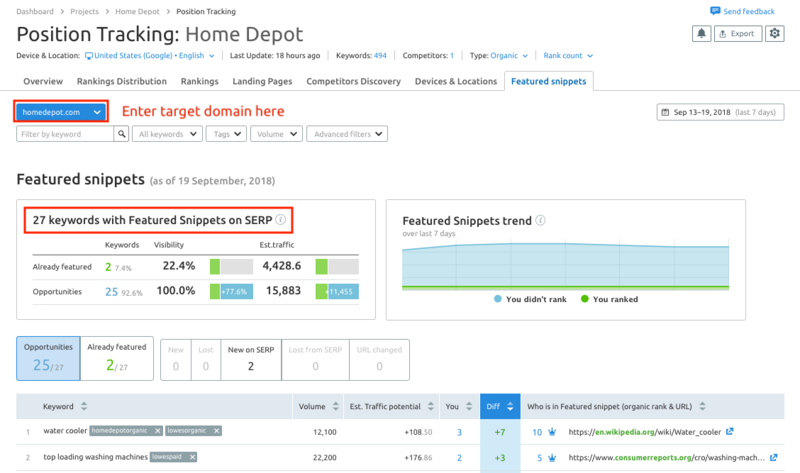 This will show keywords where there is a featured snippet and the target domain is currently (or on the last day of the set date range) occupying it. This is the easiest way to see if your website or your competitor’s website has any featured snippets among your target keywords at a given time. The “Est. Traffic gained” metric lets you know how much this featured snippet is benefiting your website with additional traffic. The number represents an estimation of daily visits from organic search from the featured snippet. This tab contains all the keywords where the target domain wasn’t in the featured snippet on the first day of the selected date range but it was in the featured snippet on the last day of the date range. These keywords represent how well your recent targeting efforts have paid off if you were going after the featured snippet. The opposite of “New,” this tab shows all of the keywords where the target domain was in a featured snippet on the first date of the set date range but was not in the snippet on the final date of the date range. This could show you which competitor of yours is trying out outcompete you among the featured snippets. If you see a lot of keywords in this list, you may want to reinvest your efforts into re writing or structuring your content to target the snippets again. This tab contains all the keywords that didn't have a featured snippet on their SERPs on the first day of selected date range, but have featured snippet on the last day of selected date range. If a keyword is marked by a you label, this means that target domain resides in featured snippet on the last day of selected date range. If it doesn’t have a you label, this could be a perfect opportunity to target a featured snippet that your competitors may not even be aware of yet. This tab contains all the keywords that had featured snippet on their SERPs on the first day of selected date range but don't have featured snippet on a SERP on the last day of selected date range. If a keyword is marked by a you label, this means that target domain was in a featured snippet on the first day of selected date range, but now the featured snippet is no longer on this SERP. This tab contains keywords that have featured snippet on first and last day of the selected date range and where target domain is in featured snippet on both dates, but with different URL. Why would you want to know this? Well, if your website had the featured snippet with one piece of content but now Google prefers another one of your URLs to the first piece, then you can begin to infer what type of content is more likely to perform well on the search engine. Your “New,” “Lost,” “New on SERP,” and “Lost on SERP” keywords will change based on the date range set in the calendar. By default, this is set to the past seven days but it can be changed with the calendar icon to the top right of the report. To get more ideas about how to optimize your pages for featured snippets, start an On Page SEO Checker campaign and add your target keywords. Then, look for the “SERP Features ideas.” Those will give you competitor analysis and tips on how to outrank your rivals and get your content in a featured snippet. How Can I Export To PDF In Position Tracking? Why Do My Keywords Show n/a Under CPC and /or Volume? How often does Position Tracking update its data? How Many Competitors Can I Follow With The Position Tracking Tool? How Many Position Tracking Campaigns Can I Run For My Domain? Why is my Position Tracking Visibility Score a different number on the Project Dashboard than it is when I go into the Project? How do I use custom triggers in Position Tracking? What are the limits of my Position Tracking campaign? What punctuation and special characters can be tracked on SEMrush?